You wouldn't usually think of Julie & Julia as a prototypical political drama, and I'm here to tell you that you would be absolutely correct in thinking that. 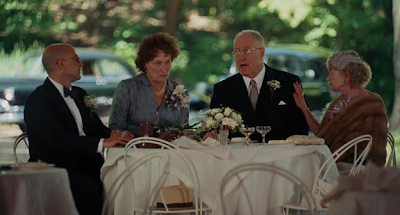 However, there is a surprising amount of political discussion between Paul and Julia's parents at Dorothy's wedding reception. Julia's Mom: How are things at the embassy, Paul? they've cut our library allowance by 90º%. 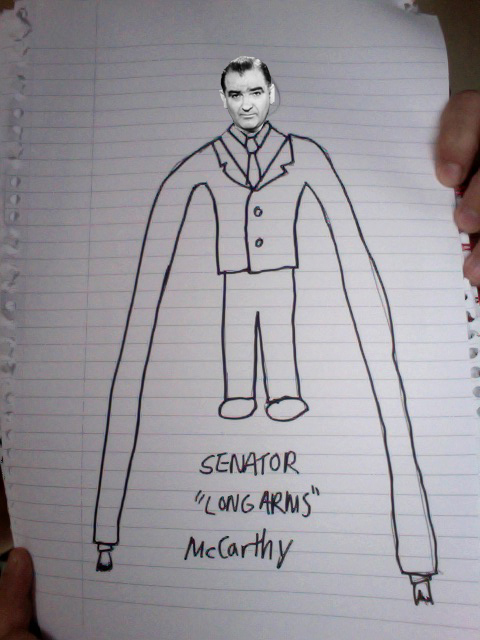 It seems that Senator McCarthy has very long arms. A normal person wouldn't think twice about this bit of dialogue. After all, the expression "has very long arms" most obvious refers to the fact that those who are in power can always catch and punish people who have opposed them, no matter how far away those opponents may go. Imagine how many midgets he could tickle with those things! Julie & Julia Quote of the Day: "Surely you're not suggesting that the French government is any better." I can't stop laughing at that picture. "Longarms" McCarthy. I love it!